Source:review copy via Think WhyNot! As the title implies,T.G.C. 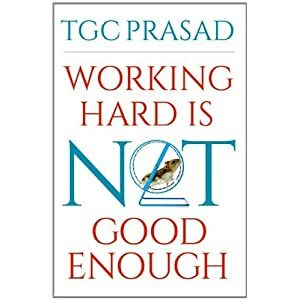 Prasad's latest work 'Working hard is not good enough' belongs to the self-help genre.This is the author's third work in the same genre (the previous ones being 'Unusual people do things differently' and 'From the eye of my mind') with this one being mostly targeted at those working in the marketing field and in the corporate sector.The book has got about a dozen chapters,each one emphasizing on a vital quality/virtue which every entrepreneur/marketing professional should possess to succeed in his/her career. As in the case of any half-decent book belonging to this genre,'WHGE',too is peppered with real life examples of highly successful men,ranging from the former American President Bill Clinton,(the late)Steve Jobs to Srichio Honda.While some of them (the examples) are quite well known(Walt Disney getting fired by a newspaper editor for the apparent lack of good ideas),there are a few ones which even the die-hard fans of this genre might not have heard of. (the story of Bill Gate's initial enterprise called the 'Tref-o-data' which failed big time).Some of these stories are genuinely inspiring and helps a great deal in putting across what the writer wants to convey to the average reader.My personal favourite is the one involving George Washington and his Army officer. The author himself promises at the very beginning of the book that this will have very little of theory and more of real life stories in it.He must be applauded for sticking to his promise as not even once has he tried to sound 'intellectual' by putting in some high end marketing jargon in 'WHGE' to impress his reader(which he could have done easily,given his background in consultancy and marketing).Even a lay person like me (Who has no interest in business and marketing) could easily relate to Prasad's writing. The book is written in simple,conversational English but it's not a light read by any stretch of imagination.Well,whatever Mr.Prasad is trying to say(the salient point being the importance of thinking and doing things differently to become successful in life)is well intentioned and makes sense most of the time but the biggest problem is that it ends up monotonous,over long(atleast a couple of the chapters deserved better editing)and a bit bland after a point.Besides,it doesn't tell anything new.Don't we know all these life-fundas already?